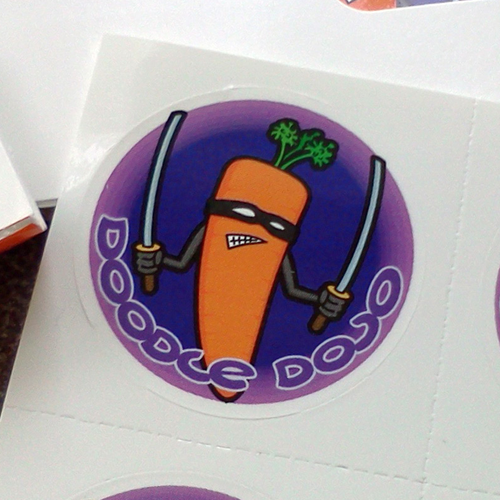 Yes thats right, you can get your hands on some of these exclusive Ninja Carrot stickers! These are different to the ones available from Zazzle. They have the Doodle Dojo name around the base and they are printed on vinyl which makes them weatherproof and long lasting. So what do you have to do to get yourself some? Easy! All you do is buy something from our wide range of awesome stuff. Take a picture of you with your purchase, wearing it, holding it, cheering and waving it about, whatever you like really, and then email it to us. Then we will send you two stickers for your trouble! We would like to be able to use the photos on this site but let us know in your email if you would prefer us not too. We won't identify you or let anyone know where you live or anything nasty like that. Just post a picture of you looking cool with your new gear. Your email address is also safe with us, we won't sell it on, or use it to bombard you with spam. That's a promise!